I'm thrilled to be writing a post (sponsored by Nuffnang) reviewing the newly released DVD, SBS Cooking Titles - "Exploring China - A Culinary Adventure", featuring Ken Hom and Ching-He Huang. SBS is my go-to for all foodie programs, with my favourite being Food Safari. Showcasing the best in local & international cuisines, SBS is home to a who's who of the food scene – along with Luke Nguyen, Peter Kuruvita, Maeve O'Meara, Tetsuya, Matthew Evans, Adriano Zumbo and many more. Ken Hom is just one of the SBS chefs and personalities whose wonderful shows are available on DVD. Click here to watch the trailer. "Exploring China" is a new series which was aired on SBS early this year, and comprises four episodes where Ken and Ching cook their way across China in a visually rich culinary journey. If you missed the premiere of this new series, don't worry because you can now get them on DVD - all four episodes in one! Read on to find out how to win one of these! Ken Hom is regarded as the godfather of Chinese cuisine and is also one of the world's leading authorities on Chinese cookery. He is also known as the man who "introduced the wok to the West". A visit to his website will show that he's a prolific producer of cook books and with a slew of TV series, there is no doubt that he makes the perfect gastronomic guide. Ching is a self-taught cook of Taiwanese descent and is based in the UK. She cooks with a conscience with an ethos for sustainability, and has already starred in three popular TV series. She is also the author of five best-selling cookbooks. In each of the four episodes (running time of 59 minutes each), Ken and Ching travel across the vast regions of China, covering Beijing, Chengdu, Kashgar and Yunnan, and the Cantonese region of Guangzhou as well as Taiwan. Their epic journey uncovers every aspect of gastronomy and culinary delight you can think of, and gives an insight to how the country's rich historical background has influenced the local culture and cuisine. Each episode provides a close look at the local food scene (street food and markets), agricultural landscapes, ancient history and family values and traditions. When one thinks of China, dishes like sweet and sour pork and dumplings quickly come to mind. This series will open your eyes to the diverse cuisine that is partially attributable to the myriad of ethnic minorities in China, where they form about ten percent of the local population. I was particularly fascinated by the episode on Kashgar, an ethnically divided city where there is a striking contrast between the modern "new city" and the ancient "old city". Kashgar is home to Uyghurs, a Turkic-speaking Muslim community, and it was fascinating to see a different side of China, especially when you don't expect to see people making naan bread in a tandoor oven on the street. Ken attempted to make his version of a popular Uyghur dish called pollo, a rice pilaf with raisins and nuts which looked delicious, like a Spanish paella. It was interesting to see how noodles (of all sorts) were still being made using traditional methods. The local women painstakingly knead the dough, roll, pull, twist and cut these noodles so perfectly like clockwork, I would imagine it took them years of practice to master such a skillful art. It's always funny to watch Ken and Ching try their hand making them, which usually ended up with a less than perfect result, much to everyone's amusement. We also see Ken and Ching visiting the homes of some of the local families, and it brings us straight to the kitchen where all the action is. From what I observe, Ching is a great cook and pretty handy with the wok (considering how petite she is) and often puts her own spin on the local cuisine. In small villages and towns where the food and cultural heritage is closely guarded, Ching sometimes finds it hard to please the locals, especially when cooking in another woman's kitchen. It was entertaining to watch how she tries to replicate some of the local dishes with a few variations, much to the faint displeasure of the older grannies and aunties who probably think that one should stick to the original recipe instead. However, the people in this show are real, the stories they tell are real, the food is authentic, and what you see is what you get. If you've ever wondered what authentic Mapo Tofu is like (since there are many versions of it nowadays), you'll find it in the "Chengdu" episode, along with other mouth-numbing Szechuan dishes. You will see a lot of "wok hei" (meaning "breath of the wok") happening throughout the programme, which must explain why all these dishes come out looking mouthwateringly delicious. The series is not just an exciting food odyssey, but it is also an emotional homecoming, a cultural adventure, and an anthropological and historical road trip. I imagine that even a non-foodie would enjoy it for the heart-warming stories, great travel and educational experience. It was both entertaining and an eye-opener for me and I highly recommend it to anyone who loves food, travel and culture. The DVDs are available at Dymocks & Sanity stores nationwide (RRP A$29.95). If you are a fan of the SBS Food series like me, you can view the entire SBS Food DVD range at www.madman.com.au/sbsfood, and find out how you can enter to win the entire collection. 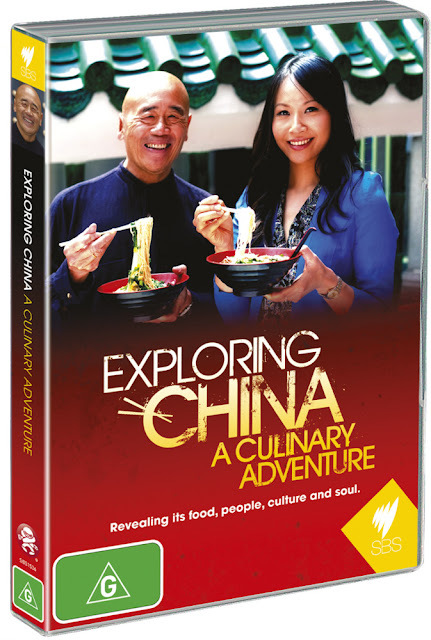 I have 15 copies of "Exploring China - A Culinary Adventure" DVDs to give away!! Why would you love to watch "Exploring China - A Culinary Adventure"? This giveaway is open to Australian residents only. This giveaway commences 9:00 am AEDST on 14/3/13 and ends 5:00 pm AEDST on 22/3/13. Good luck!